So much in my life overlaps with music. I’d say it’s my number one passion. And my other passions, well, they’re interwoven with music as well somehow. Because…when I hear music, I hear so much more. And when we talk about music, we talk about so much more. What We Talk About When We Talk About Music is a documentary piece about a unique music group in Melbourne. The group is made up of members from the Asylum Seeker Resource Centre - diverse individuals positioned in such diverse circumstances, but all seeking a safe future in Australia. This documentary focuses on these musicians, and what they achieve together every Wednesday evening at the group's rehearsals. What occurs in rehearsals is more than making music, and what we talk about turns out to be much more, as well. Music is culture. It is tradition, and identity. It is celebration, and ceremony, and protest. It is therapy, it is family. It is contact, engagement, language and place. Over a few months, in making this documentary together with the musicians, I’ve come to know the group and the individuals, and learn their songs. And they’ve come to learn a lot about me and about community radio. In fact, I’ve learned a lot about Community Radio, too. I’ve realised more significantly the space for expression that community radio provides, and about the politics of voice from individuals who can’t always use their names. 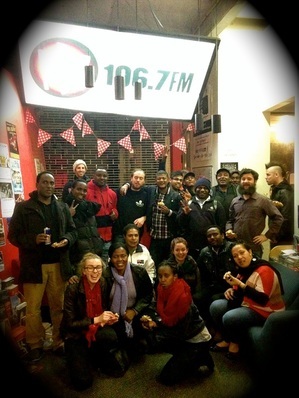 I see how community radio has a great capacity for making radio with others, and not simply about them. So listen and hear these musicians, their music and their voices. Hear all the things we come to talk about when we talk about music. Thank you to the ASRC Music Group for their friendship, creativity and hard work. You can learn more about ASRC and its work here. Thank you to Giordana Caputo at CMTO for the generous and thorough training that saw this piece come to fruition, and to the project mentors. Thank you to my home station PBS for supporting this piece. Vivid Sydney, the world’s largest festival of light, music and ideas, will this year put a spotlight on the role of community and public radio during the Vivid Ideas program. It will discuss the role of community and public radio in unlocking creative potential of Australian communities by sharing diverse voices in interesting ways, connecting community members and building a distinctly Australian media culture. 'Digital killed the music industry!' many said.